Even gardens that do not have a lot of space are going to be able to host the incredible, 7′ x 5′ Traditional Pent Security Shed. Anything that you hold dear or even just something you have spent a lot of money on like your electric lawn mower or your prized power drill will be safe, dry and out of sight inside here. 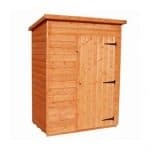 This shed offers you lots of security, privacy and also the storage space can be maximised very well by planning things out or even making use of the generous height by adding shelving. Small and out of the way windows let in light, but keep peeking eyes out which is exactly what you want in a shed like this. The cladding and the pent roof is going to do just an amazing job in keeping the rain out and making sure the things you love do not get rusted and ruined. The whole shed has been designed to be very robust and this is achieved thanks to a strong frame that is supporting thick tongue and groove shiplap cladding. The floor and the roof are made from similar tongue and groove boarding so that they can take a lot of weight and also last for a long time. The whole shed has been very cleverly designed so that it will keep things safe, last many years and also not cost you a fortune to purchase. 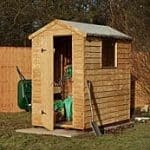 This compact sized shed is ideal for smaller gardens or even as an extra shed in a larger garden, for a little bit of extra security to keep something expensive like a bike or some pricy gardening gear that you may have. 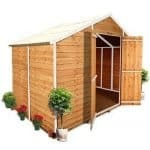 The dimensions of the shed make this something which will really fit into any type of garden as the width of the shed is 7 feet and the depth is 5 feet. True this is not a huge amount of space, but it just means that when you store your belongings, you will have to be a bit more creative with how you go about it. The height of the shed is higher than you would think as at the highest point it is 6 feet 7 inches and even the lowest part of the shed is not that low as it is 5 feet 9 inches. To keep the rain from rusting up all of your stuff, Treetops Traditional have used a pent roof. This is a very well designed roof that thanks to the angle it is, you will find rain just always rolls off it. The roofing felt is of a high quality and underneath this, you will be very impressed as there are 12 mm tongue and groove boards. Made with very high quality redwood the 12 mm thick tongue and groove shiplap cladding has been crafted so that it has a very appealing look, but also so that it is sturdy, water proof and of course is going to offer you a whole lot of security. Treetops Traditional really do make sure their shed have wonderful cladding from both a looks and quality point of view and this model here with its compact size does feel a little bit more robust than some of the other ones we have seen. The cladding is very strong, but the frame behind it is what really makes this such a sturdy structure. Made with the same redwood as the rest of the shed, the frame is a very solid, 44 mm x 27 mm and with its rounded edges it is going to stay firm for many years. This is the kind of shed that we are sure when it is built, you will give it a little tap, slap or shove and love the way that it just stands there and takes it while showing how robust it is, well you have the frame to thank for that. Treetops Traditional know the types of things which will be stored in a shed like this will be a bit more pricy. So with that in mind they have made sure to put one very strong floor inside here. The floor is made with 12 mm tongue and groove boarding and can take quite a lot of weight and not show any signs of stress. How strong the floor is, is one of the things that impresses us most about this shed. We always appreciate when a shed comes with a free basecoat treatment, but please do not make the mistake of thinking this will last the whole life of the shed. As a matter of fact, Treetops Traditional recommend that you treat the shed within six weeks. Actually we would recommend, you should do it perhaps even sooner than that. A generous coating of treatment once a year is all you need to do to look after this shed. A one year guarantee will give you peace of mind and cover you in case there is an issue with rot or some kind of fault with the materials. A thief would take one look at the door on here and then just walk away. That is the kind of impression this door gives. It is a very secure and strong door that is kept in place with three very high quality and heavy duty hinges. 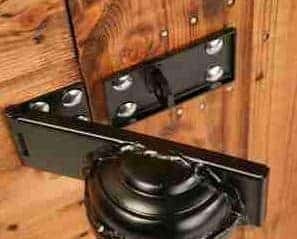 There is even a padlock protector which is just fantastic, but the only thing we have to criticise the shed for is that there is no padlock included with it. Which considering they put a padlock protector on here is a little strange. Still despite that this is still a good door and at, 2 feet 6 inches wide and 5 feet 9 inches high, you will get in and out of here with ease. The set of small horticultural glass windows which are placed high on one side of the shed are one of the best features of this shed. They have such a great look, but at the same time they are not easy to look into which as the theme of this shed is security is a good thing. Your expensive lawn mower, your prized bike or even the kids summer toys will be securely locked away inside of here. When you add a padlock this is as secure as a shed can be and we are sure that even if you went away on holiday for a couple of weeks, you would have no concerns over leaving things inside here. It is really hard to look inside this shed thanks to those awesome windows which really is the point of them. They let in enough light so that you can look in your shed and see where and what everything is, but the size and the position of them make it so it is not easy to glance and see what is in them when you are walking past. 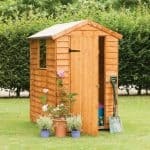 One thing we would suggest that would make this shed be perhaps a little bit incognito would be to give it a coating of dark wood treatment or even perhaps a shade of green if you have it installed next to a tree, bush or something like that. This way you can make it blend it into your garden and be kind of unnoticeable to people walking past. One of the main extras that is available with this shed is the installation service. This costs £94.99, but if you do not have the time or the desire to build it then this is worth considering. A set of floor bearers can be added for £24.99 which while not essential would be something to consider if you were building the shed on grass. 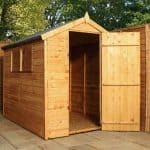 The overall quality of this shed is very high and for the price it is actually pretty incredible the shed is as top quality as it is. Really this could be the only shed you ever need as long as you take proper care of it. These materials are thick and robust and they just require an annual coating of treatment from you to ensure a long life. This is a small shed there is no denying that, but we think you would be very surprised at how much you could actually fit inside of here. As they have an installation service you may want to consider that, but if you do decide to take this on, then follow the instructions and it should take you no more than a couple of hours with the help of a friend. While the size may be on the small size there is no disputing the fact that the quality is very high. The price we feel is perfectly reasonable for a shed of this quality. 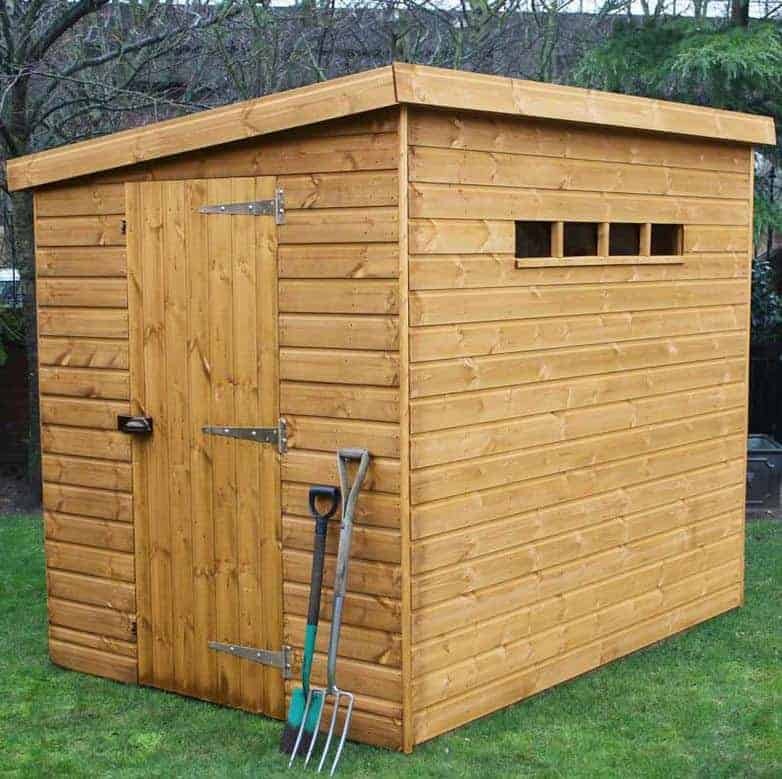 Final Thoughts: Hopefully not too many people will be put off with the size of this, because really the 7' x 5' Traditional Pent Security Shed is one fantastic compact shed. 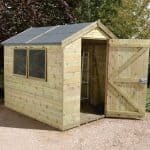 We can see this being the main shed in a smaller garden or an extra shed for those extra special items which require more security in a much larger gardens. It has a great look to it, particularly those small windows and we feel that it is going to be something you are happy to have as part of your garden. If you do not want to spend a whole lot of money, but still want to keep a few things safely locked away then this shed is a great way to do it.